While you were raking up leaves in the yard, he let you blow your nose on his sleeve. He slow danced with you on the sidewalk outside Barnes & Nobel. He sang to you "'You light up my life, Blah blah blah blah'... And I really mean those blahs." A few months after you got married and before you had money to get cable, the Summer Olympics began. Callaway went out and got an antenna so that you could get 2 stations, and 1 of them had the Olympics. It was sweet that he remembered how much you love them. He gave you a gift in an NSYNC bag. He took you bowling and said he'd give you a massage if you won. When you lost, he gave you one anyway. He said "I haven't come home with flowers for no reason in a while. So I got you a lottery ticket." 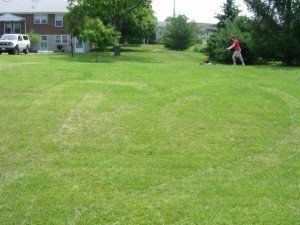 He mowed your initials into the lawn. When you started dating, he went out and bought strawberry Pop Tarts so there would always be at least one thing for you to eat when you went to his apartment. He said "You're like a thousand fully functioning channels of HD." When you later read him the quote about the HD thing he said "Make it two million." A few weeks after you were married, the tiara you wore on your wedding day was sitting on the kitchen table. Callaway was pushing it around and you said "Go ahead, honey, put on your crown" thinking it would be cute to see your new husband in a tiara. And he came over to you, grabbed you by your knees, and tried to put you on his head. When I was in the fifth grade, I had a crush on Bart Simpson. Even though I had to be something like ten or eleven, I still couldn't process the fact that he was a cartoon, therefore not real, and that the ability for us to actually be together would require Easter Bunny-like levels of magic. In fact, I think it took months for me to figure that out, all the while wearing my Bart Simpson watch to school everyday, thinking I was normal because all the other girls had celebrity crushes too. There. And now I live with people in my head whining to me about telling their stories. Turned out fine.